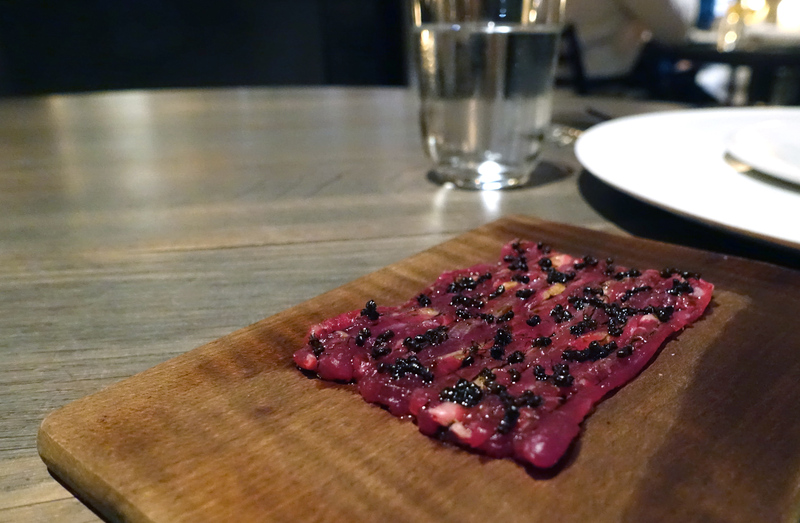 The restaurant itself is a really great space – spacious yet somehow intimate, airy but warm. We went to Noma for supper but during the day I imagine the view out of the windows of the boats moored at the dock just outside is beautiful. The staff are all so friendly, passionate and knowledgable about the food. The fact that all the staff, including the chefs, come out to greet you on arrival is an amazing welcoming touch and we also really enjoyed being given a tour of the kitchens at the end and discovering a bit more about quite how much work goes into coming up with and executing the dishes we had just eaten. 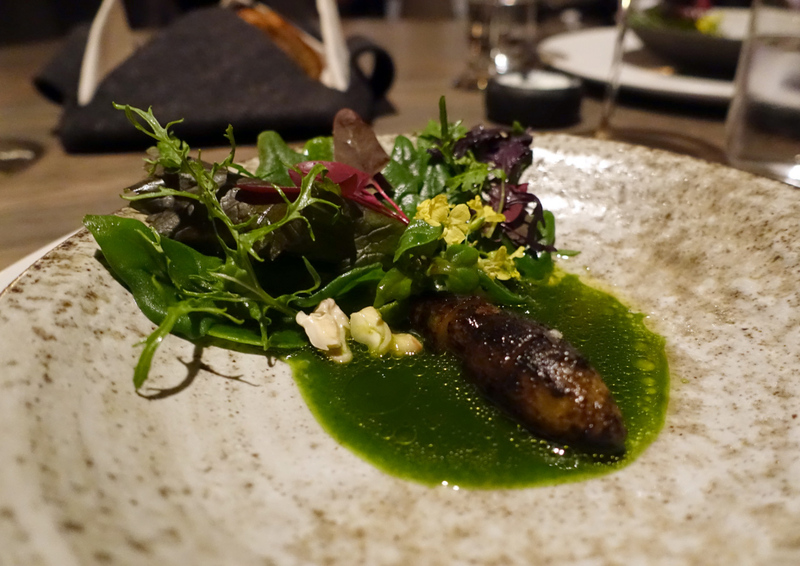 The tasting menu is made up of a lot of different courses so this post will be pretty picture heavy. I won’t comment on all the dishes but this by no means means I didn’t enjoy them – just trying to keep the post from turning into an essay! Frozen fermented gooseberries and redcurrant. 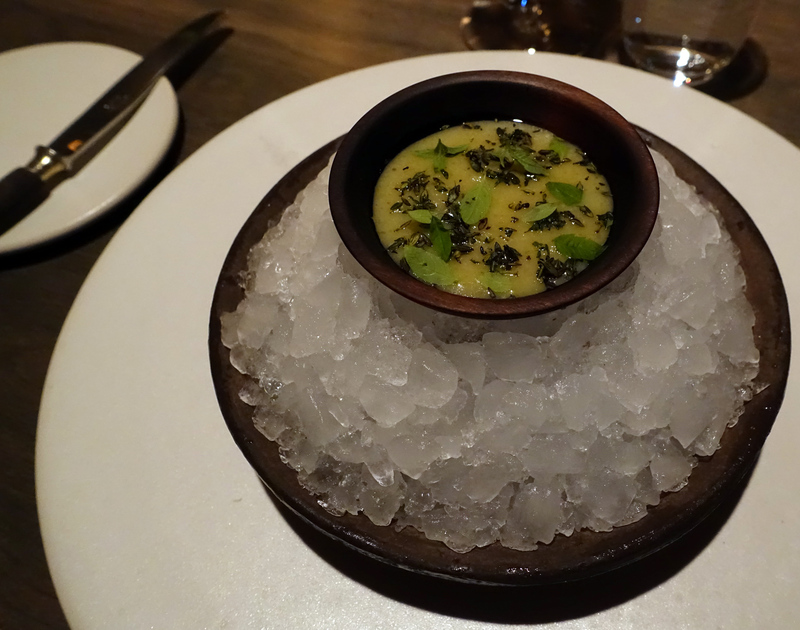 This was a kind of chilled apple soup with notes of watercress, thyme and lemon verbena. A delicious and refreshing start to the meal. 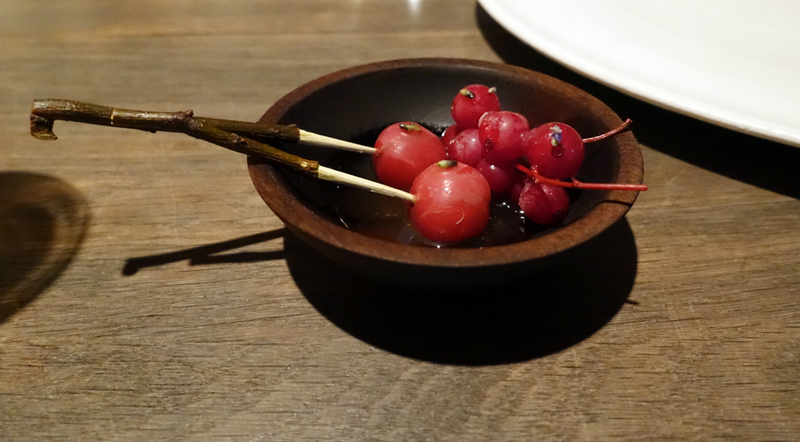 Blackcurrant and rose petals – the ‘blackcurrants’ were actually ice casings which melted in the mouth to reveal liquid blackcurrant goodness…I loved the surprise element of this dish. The scallop was made into a delicious rich, fishy ‘fudge’ (which you can’t see in the picture) into which the cucumbers were dipped. The fried cabbage was so fine and crisp that it practically broke in the hand. 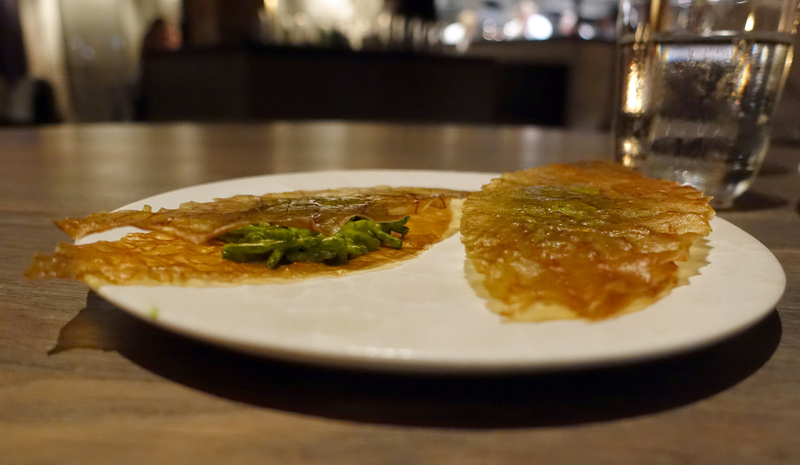 I really enjoyed the different textures of the crunchy cabbage and the soft creamy samphire filling. 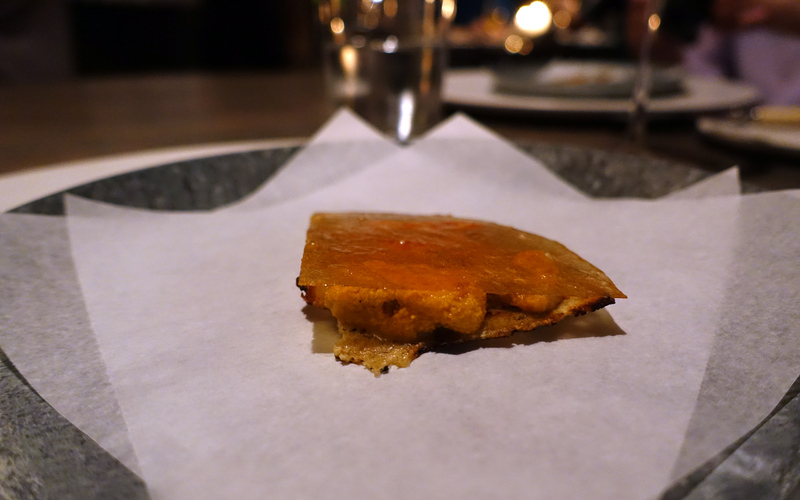 Caramelized milk and monkfish liver. Among my favourite of the starters – the flavour of the monkfish liver was very rich but the chefs included just the right amount in the dish so that it didn’t overwhelm. Mixing the liver with the slightly sweet flavoured crunchy milk base was the perfect combination both in terms of flavour and texture. Turbot roe, rocket, cream and parsley oil. The cured roe was full of amazing flavour and went well with the light cream below. 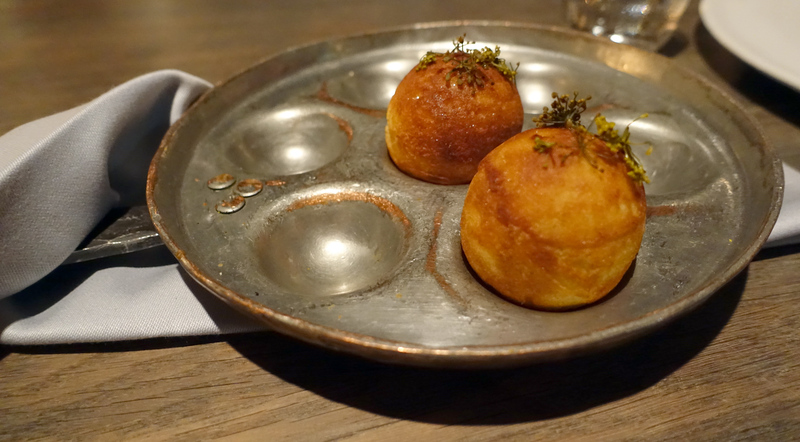 Traditionally a spherical apple pancake, the Noma version was a light, fluffy savoury batter filled with delicious wild greens. I could have eaten a lot of these if I hadn’t been saving myself for the rest of the meal. 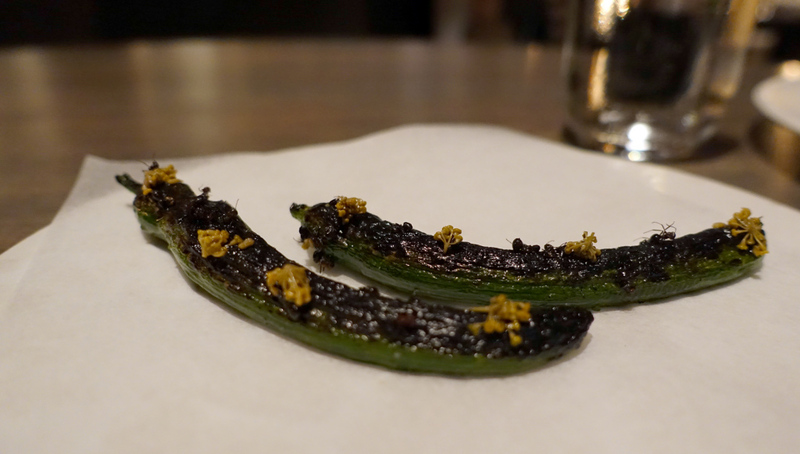 The final small dish was burnt onion and walnut oil. 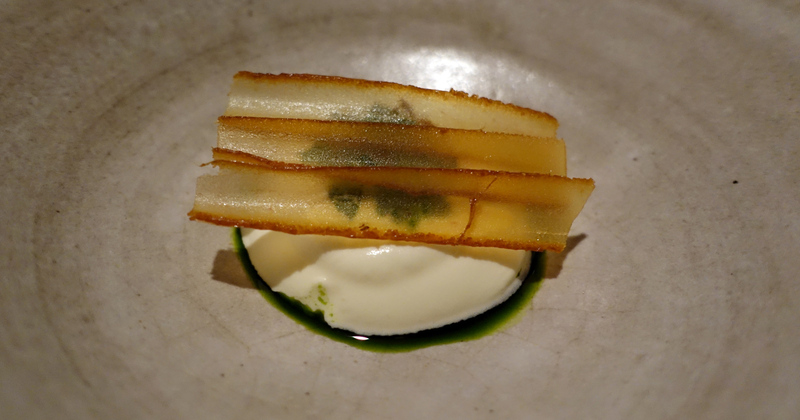 The first of the larger dishes was squid, broccoli, yeast and parsley. The crockery was beautiful throughout the meal but I was particularly mesmerised by the ice bowl that this delicious dish came in…stunning. 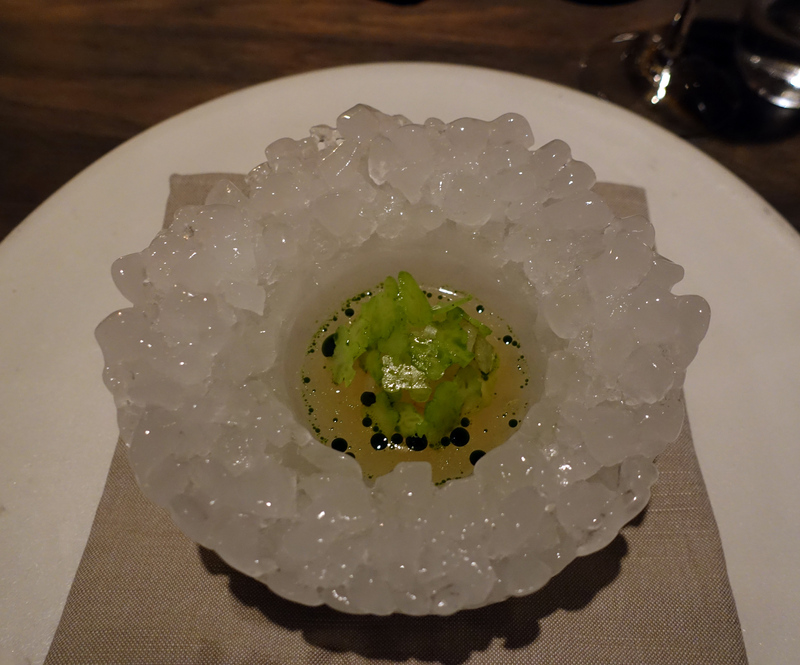 Pumpkin and caviar with kelp and beechnuts followed – this was probably the stand out dish of the meal for me. 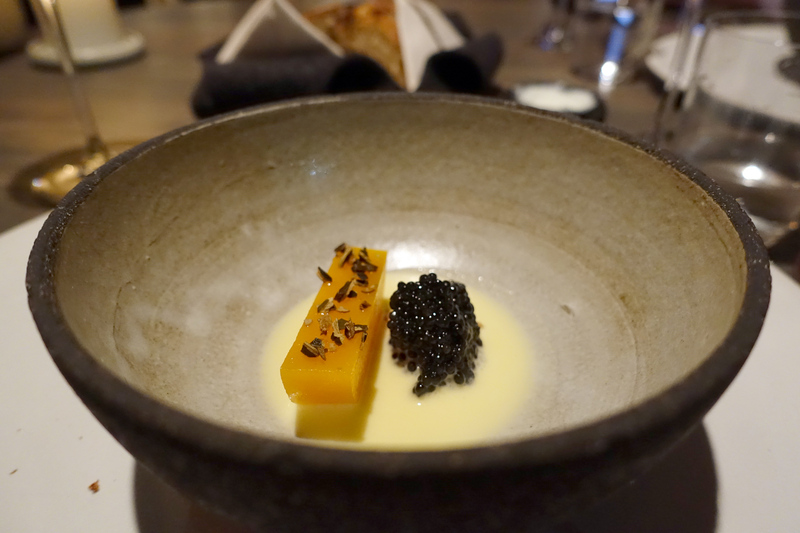 The pumpkin was perfectly cooked and I loved the contrast of the salty caviar with the richer beurre blanc-esque sauce (made with the barley). 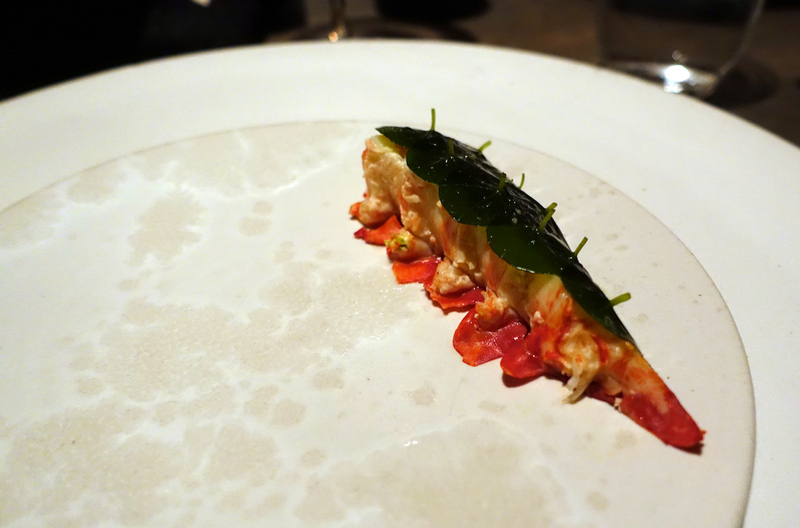 Lobster with nasturtium followed. 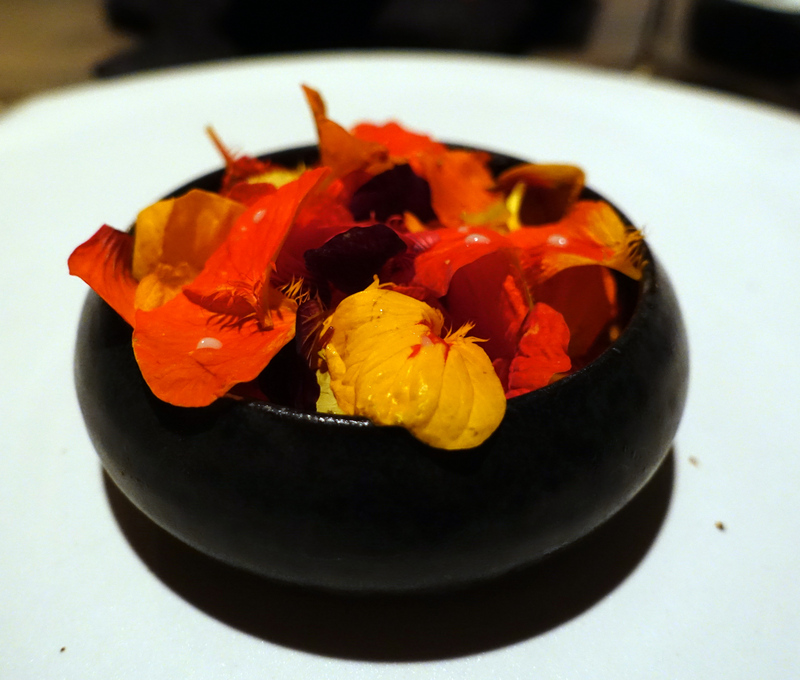 This dish came in two parts: a subtly flavoured lobster broth topped with peppery nasturtium flowers. Followed by the lobster tail wrapped in nasturtium leaves (photo at the top). I thought this dish was one of the most beautiful of the night but felt the lobster was slightly lacking in flavour. The salad root, fresh walnuts and St John’s wort was a really interesting earthy dish. Egg yolk, potato and rose oil. 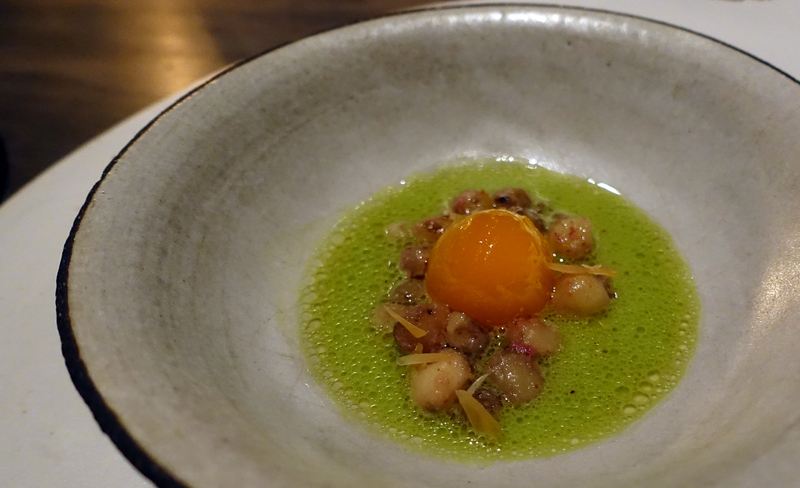 The egg yolk had been cured (which made it a bit thicker and heavier than normal) and the potato made into little pearls which were cooked in rosehip oil giving the dish a slightly floral overtone. The final large dish was roasted bone marrow with cabbage and nasturtium. Designed to be eaten like a taco, the boy positively devoured this dish and assured me that it was the best bone marrow he’d ever had. 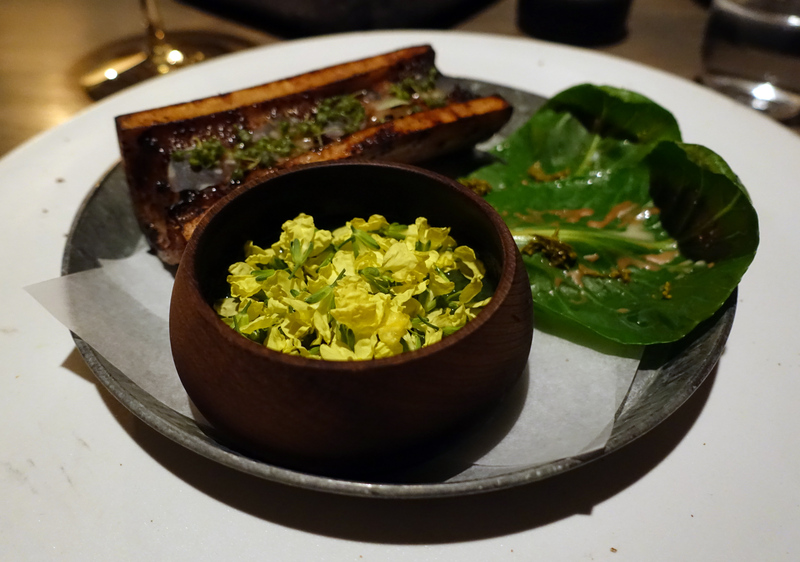 I don’t have a whole load of experience of bone marrow but I enjoyed it more than I expected and appreciated the smokiness that came from cooking it over the outdoor charcoal barbecue. 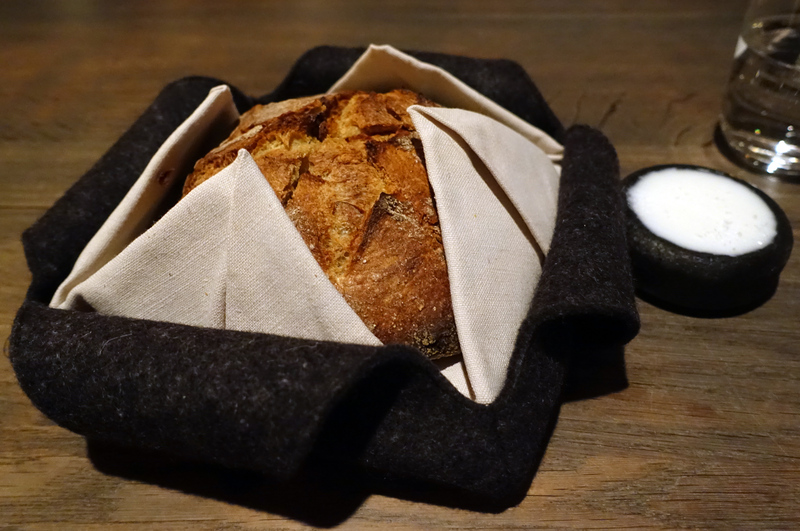 Alongside the mains we had an amazing warm fresh out-of-the-oven sourdough, which (luckily for a bread fiend like me and not so good for my over-worked digestive system) they continued to replenish throughout the meal. We had two puddings: Aronia berries and sol. 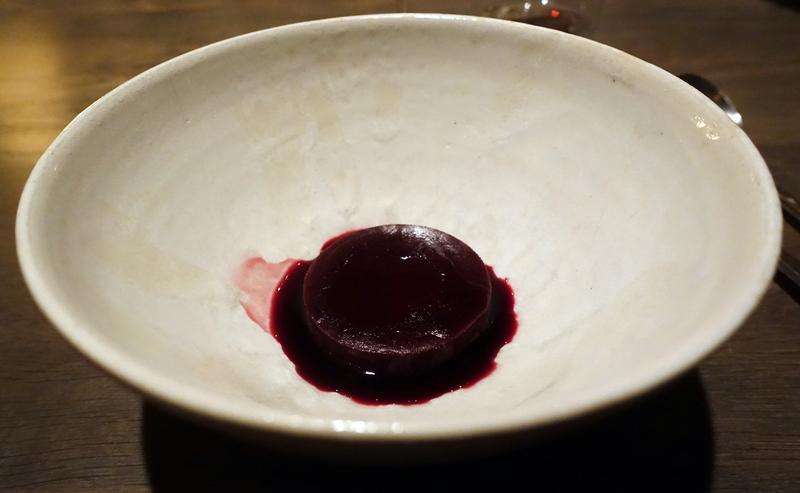 The chefs constructed an ice casing from the juice of the wild aronia berries and once you broke through this there was an ice cream filling. And mashed potato with plum. 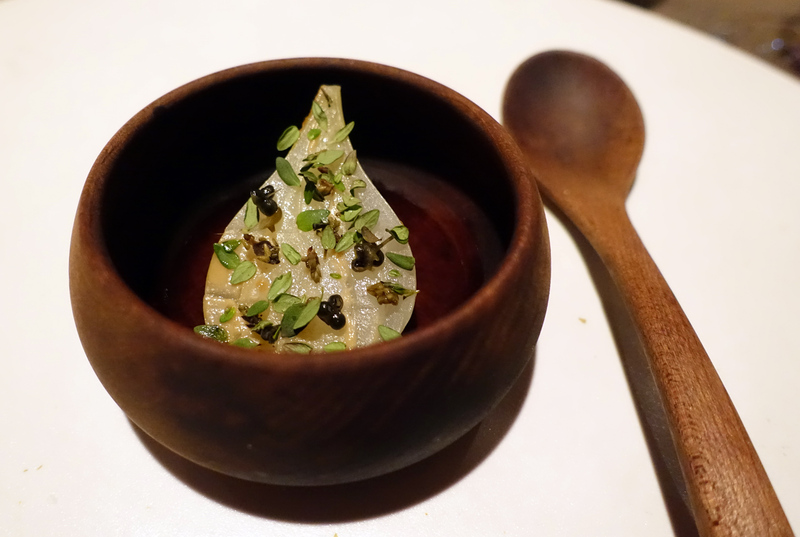 I understand that the restaurant has a philsophy based on foraging and that the idea is to create dishes around flavours in their purest and most natural state, but am I a really bad foodie if I say I just would have preferred something a little more traditional (and sweet) on the pudding front?! 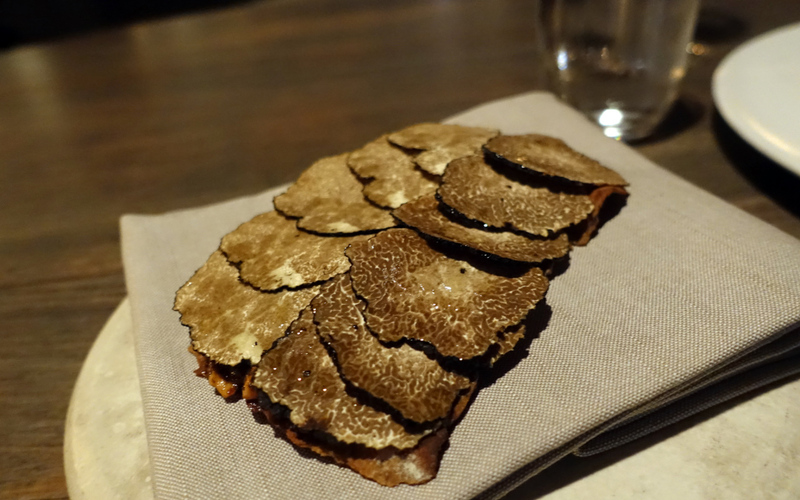 The meal ended with two extra little treats – cep mushroom cookies covered in chocolate. 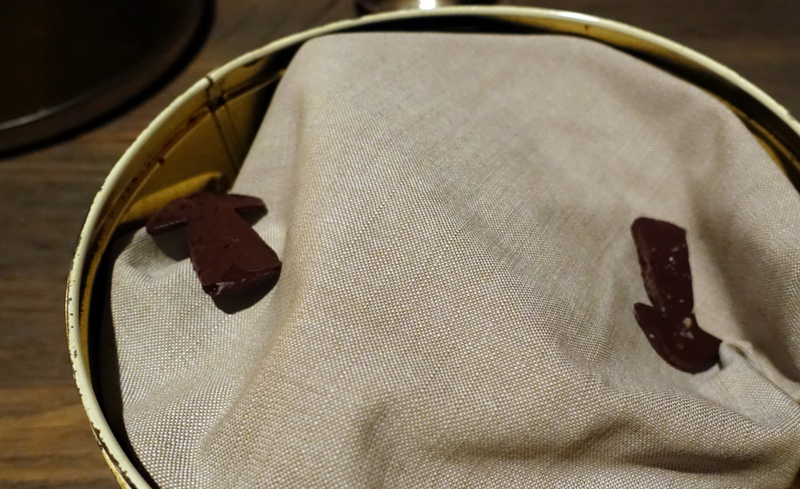 These cookies were made out of dried mushrooms which were soaked in a birch syrup to rehydrate them and the chocolate was topped with a liquorice salt. The cookies were a bit chewy and you could really taste the mushroom but it worked and I definitely would have eaten another! 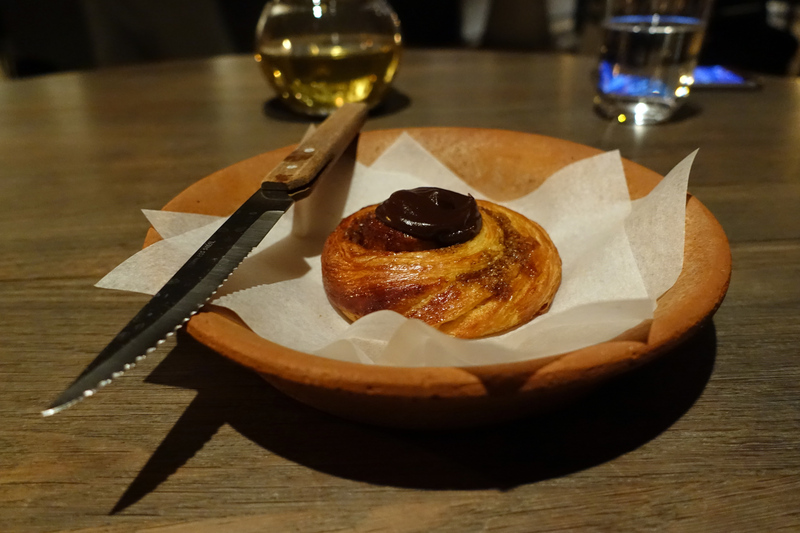 And a traditional Danish pastry made with fermented barley. This was flaky and buttery and delicious…and the generous dollop of chocolate in the middle sated my need for sugar so I left the restaurant a very full and satisfied lady. 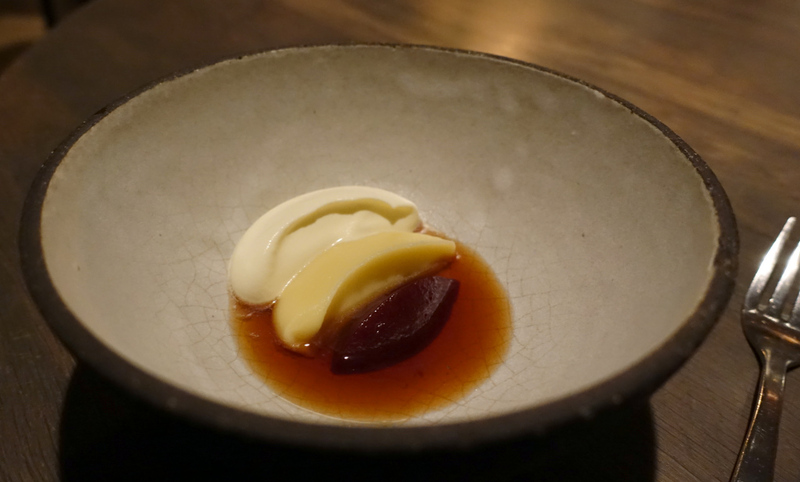 Although I didn’t love every single dish I would say Noma is somewhere to be experienced if you ever have the chance – it really does serve completely different, inventive dishes and introduces you to flavours and textures you would never even considered. 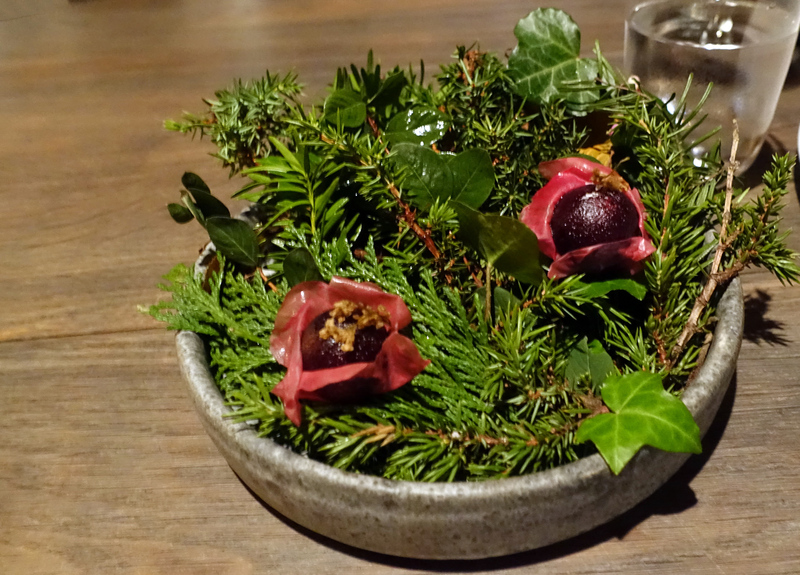 Noma can be found at Strandgade 93, DK-1401 Copenhagen K.
This entry was posted in eat and tagged Copenhagen, Denmark, gourmet, michelin, Michelin Star, Noma, tasting menu, Two Michelin Star, world’s 50 best restaurants. Bookmark the permalink.